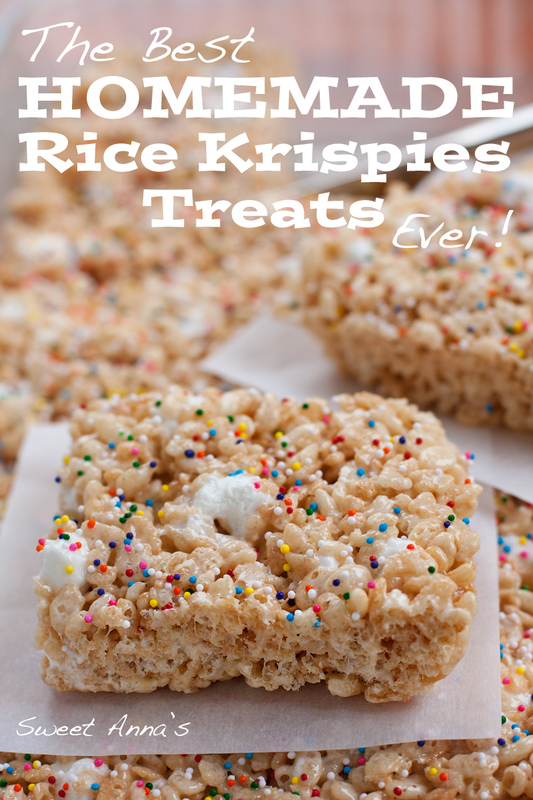 Ok, I know you are thinking that there is really nothing special about a Rice Krispies Treat, but you just have to give these a try. I think you might surprise yourself. The vanilla, the salt, the extra marshmallows (the sprinkles if you want them, because – I mean, sprinkles! )… I’m telling you, you’ll never go back to that recipe on the back of the marshmallow bag or cereal box again! These bars are simple, quick and easy to make, but they pack a little pop and a lot of marshmallowy gooeyness. Basically, they are bliss. Make them for your next kiddo-birthday party, or just to spoil your family. Because we all know… hiding inside of every responsible adult is a treat-loving little kid! Butter a 9x13” baking pan and set aside. In a large pot, melt the butter over medium heat. Stir in 6 cups of the marshmallows and melt, stirring often, until they are just smooth. Remove from the heat and stir in the vanilla and salt. Stir in the crispy rice cereal until well coated and then stir in the remaining 2 cups (or so) of marshmallows and immediately transfer to the buttered baking dish. Press the mixture down gently into an even layer (run your hands under cold water and then use your hands for this to make it easier!). Sprinkle lightly with sprinkles, if you’d like, and let cool completely before cutting. *These will store in an airtight container for several days on the counter, if they last more than 5 minutes! Do not freeze.